Midfielder James Maddison insisted the goals will soon start to flow from Norwich after scoring the only one of the game in their win at Middlesbrough. They have now kept five successive Championship clean sheets, with three 1-0 victories and two goalless draws. 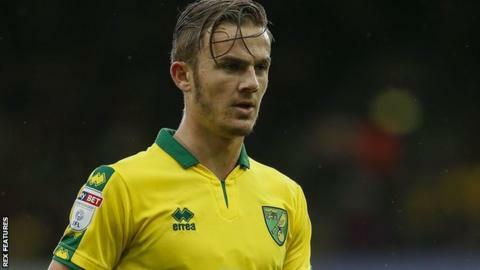 "It doesn't matter if we win 1-0 every game," 20-year-old Maddison told BBC Radio Norfolk. "We've got a lot of talent, there's definitely goals in this team, but at the moment we're having to dig in." Head coach Daniel Farke put the focus on tightening up his defence after a 4-0 defeat at Millwall last month and it has certainly paid off. "Five clean sheets in a row speaks for itself. We highlighted that we had problems, not with the defence, but as a defending unit across the whole team," said Maddison. "Credit can only go to the boss and the coaching staff because they've worked relentlessly on the training ground to put it right." Maddison's superb curling effort at the Riverside Stadium was his second strike of the season for the Canaries. He described it as "one of the best I've scored" and continued: "Playing in the Championship and starting games, I'm learning something new every day, and constantly improving my game. I'm learning and constantly getting better." Farke gathered his players together on the pitch at the end of the match. "To come to a stadium like this, it's a Premier league ground and a Premier League club, and play the way we did, show the character we did, is just a credit to the team, the boss and the whole club," said Maddison. "He said sometimes you have to take a step back and realise that what we've done is special. To come to a place like this and send the fans home happy, that's a great achievement and we should be proud of that."